The Dell Networking X1026P is a 24 port smart managed 1GbE Ethernet switch designed for small and medium businesses who crave enterprise-class network control fused with consumer-like ease. 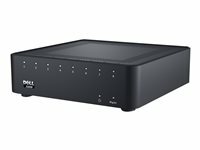 The X1026P has 24 Ports of PoE/PoE+ with a budget of up to 369W. Setup and management are greatly simplified with an intuitive GUI and hardware design. Practical innovations for small networks :- Powerful tools inside an elegant interface with app-like functionality make X-Series switches a pleasure to use. Familiar commands and alerts similar to PCs and servers means there is less jargon to learn and more knowledge to gain. Connect, auto-configure, and power VoIP phones and wireless access points with PoE. The Dell Networking X1008P is a 8 port smart managed 1GbE Ethernet switch designed for small and medium businesses who crave enterprise-class network control fused with consumer-like ease. The X1008P has 8 Ports of PoE with a budget of 123W. Setup and management are greatly simplified with an intuitive GUI and hardware design. The X1008P is a compact 8-port unit designed for desk, wall or ceiling mounting with a smart design. The Dell Networking X1018 is a 16 Port smart managed 1GbE Ethernet switch with 2x 1GbE SFP Ports designed for small and medium businesses who crave enterprise-class network control fused with consumer-like ease. Setup and management are greatly simplified with an intuitive GUI and hardware design. 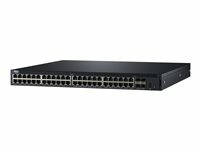 The Dell Networking X1026 is a 24 Port smart managed 1GbE Ethernet switch with 2x 1GbE SFP Ports designed for small and medium businesses who crave enterprise-class network control fused with consumer-like ease. Setup and management are greatly simplified with an intuitive GUI and hardware design. 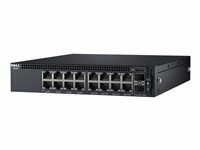 The Dell Networking X1052 is a 48 Port smart managed 1GbE Ethernet switch with 4x 1GbE SFP Ports designed for small and medium businesses who crave enterprise-class network control fused with consumer-like ease. Setup and management are greatly simplified with an intuitive GUI and hardware design. The Dell Networking X1052P is a 48 port smart managed 1GbE Ethernet switch designed for small and medium businesses who crave enterprise-class network control fused with consumer-like ease. 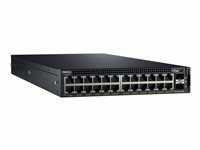 The X1052P has 24 Ports of PoE/PoE+ with a budget of up to 369W. Setup and management are greatly simplified with an intuitive GUI and hardware design. 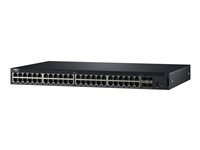 The Dell Networking X4012 is a 12 SFP+ port smart managed 10GbE Ethernet switch designed for small and medium businesses who crave enterprise-class network control fused with consumer-like ease, Smartly designed for desk, wall or ceiling mounting.